Just the other day I was thinking how nice it would be to have my game added to Bruno Faidutti's famed Ideal Game Library. Today, I found it there! He is mainly positive, preferring the "bid refunds" optional rule to moderate the widely perceived run-away leader problem. Once again, I am very glad I argued for the inclusion of this very rule, and I am thankful that SJG listened. Revolution! also got a positive review from Sam Healey (sometimes co-host of The Dice Tower with Tom Vassel). 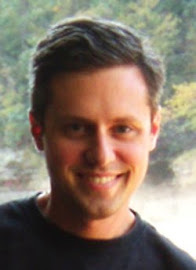 He mentioned to me that Revolution will be featured on the podcast in an up-coming episode. 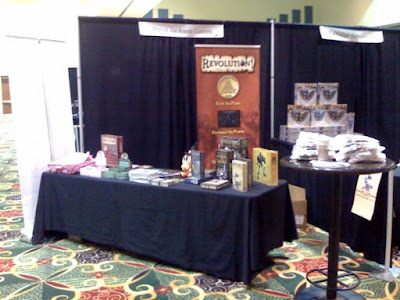 Here's a picture of the booth from Phil Reed at ACD in Madison, Wisconsin. They flew direct from PAX at Seattle, Washington. These folks sure get around! Meanwhile, my "demo" at Sci-Fi City tonight consisted of one game between my eldest daughter (age 7), myself and Joe, the MIB guy (part of the SJG volunteer army). They did have one customer who bought a comic book. And a few guys in the back were playing D&D. It makes me very glad that I'm not still trying to sell my game on my own. Real professionals are doing real promotional work at real conventions--my hat goes off to you! Tonight I ran a few demos of Revolution! at Yottaquest. The "regular" board game crew moseyed in about 7:00 for their weekly fix. I played in the first game of Revolution! and got absolutely CRUSHED by all of my opponents! They were shrewd players indeed. I'll have to get a rematch one of these days . . .
One big group played Parthenon most of the night. I got in on Battlestar Galactica (with Pegasus expansion) towards the end of the evening. The humans went down hard to the many Cylons. I'm not quite sure how I feel about this game yet. It was very complicated, but there is an interesting dynamic at work what with all the mistrust and treachery involved. Overall, it was not the most effective promotional experience I've had. On the other hand, about 15-20 more people now know of my game's existence and may end up trying it out soon. Maybe my session at Sci-Fi City Thursday will be more productive.